Description of the school’s model program/practice. At Alliance Judy Ivie Burton Technology High School (Burton Tech), we believe strongly not only in setting high expectations for teaching and learning but also in supporting teachers and scholars in meeting those expectations. Our model is comprised of several intertwined systems: our GROW evaluation system, GROW coach training, Professional Learning Communities (PLCs) and our Multi-Tiered System of Supports (MTSS). Nearly a decade ago, Burton Tech committed to a coaching and feedback system known then as TCRP (The College Ready Promise) and today as GROW. As Judy Burton, former Alliance CEO and our school’s namesake, once said, this system helps “advance effective teaching, attract and retain the best teachers to work with the highest-need students, and dramatically increase the number of college-ready graduates.” The system includes teacher effectiveness measures, observation and feedback protocols, professional development and a compensation system that rewards excellent teaching. The GROW effectiveness rubric contains many elements from the tested and research based Charlotte Danielson Framework for Effective Teaching which clearly defines what good instruction looks like. GROW coaches (chiefly school administrators) are trained in the latest coaching methods. Coaches have gained PD on the Uncommon Schools system of coaching and feedback. This led to a significant to frequent informal observations with debriefs utilizing Uncommon Schools protocols. This gives teachers frequent bite-sized, high leverage action steps to improve their instruction. Strong systems for professional learning communities have been implemented first in Math and now in English. Led by content level specialists, Math and ELA content teams are supported by the leadership team to create systems that help promote all students progress towards grade level standards. These PLC’s use student data to inform what primary focus needs to be addressed each year. The PLC structure requires the Math and ELA departments to meet weekly for a total of 2 or more hours of professional learning that is rooted in planning, instructional practice, and data/student work analysis, which supports the key elements of the instructional cycle. Burton Tech has refined its Multi-Tiered System of Supports (MTSS) to further help all scholars succeed in our college-ready classrooms. Wrap-around services are coordinated chiefly by an administrator with a counseling background who leads a team of two academic counselors, a social worker, a school psychologist, the Special Education department and assorted instructional aides to ensure that these services are efficiently carried out for our high need students. This includes ensuring the Language Acquisition Team (LAT), the COST and SST (student success team) processes are done well and with fidelity and that students are appropriately placed in weekly after-school tutoring sessions. Why the school’s model program and its practices were adopted; the need it is addressing. When we initially adopted GROW (then TCRP), our goal was to reach high rates of college acceptance for our scholars. As part of this effort, we ensured (and continue to) that each scholar met their A-G requirements by graduation (unless determined otherwise by an IEP) and that standards based instruction took place in every classroom. We have largely succeeded in our college acceptance goals. On average, 85% of Burton Tech scholars are accepted to four year universities. Unfortunately, only about 25% of our scholars successfully complete their post-secondary education. We want to help support our scholars to get to and through college with a goal of at least 75% of our scholars graduating from a 4-year university. This new goal of 75% college completion, in addition to the advent of more rigorous content standards, was a key driver in Burton Tech implementing systems to improve support for the GROW system specifically and teaching and learning in general. We cannot ask more of our scholars and teachers without first supporting them in this effort. The essential resources needed for initiating the model program/practice. GROW (then named TCRP) was initially funded by a sizable grant from the Bill and Melinda Gates Foundation. Burton Tech (as part of the Alliance for College Ready Public Schools) took part in an effort (joined by other Charter Management Organizations as well) to develop and refine a system of observation and feedback that would foster and reward excellent pedagogy. Additional pay for highly rated teachers is a continuing expense of this system. Essential resources dedicated to support GROW include outside professional development (in the case of GROW coach training) and additional staffing (in the case of developing our PLCs and shoring up our MTSS systems). The goals and anticipated outcomes of the model program/practice in relation to teacher and administrator professional development and support. The goal for the program as a whole is to support scholars and staff in meeting 21st century expectations of teaching and learning. We want educators to both meet the standards of highly effective teaching outlined in our GROW rubric and also to leverage our PLC work to become independent educational professionals who work with their peers to share best practices, analyze data and co-plan for how best to help our scholars succeed. We want administrators to be strong educational leaders that can both set an inspiring vision for the school and effectively dig in to the day to day work of effectively helping our teachers realize that vision. The goals and anticipated outcomes of this model program/practice in relation to students, parents, and community. At Burton Tech, our ultimate goal is equity for our scholars. We want them to have the same chances of succeeding as their more affluent peers. This uplifts not only our scholars but their families and communities. How this model program/practice benefits all students and affects school-wide achievement. How this model program/practice benefits unique student populations. Supporting our most vulnerable students is a critical component of our GROW system. Teachers are coached and evaluated on how well they differentiate their lessons and whether they integrate language supports and IEP accommodations. Furthermore, our Math and ELA content leads work tirelessly with our PLCs to disaggregate performance data and analyze work samples to ensure that the needs of our most vulnerable students are met. Finally, our MTSS team acts as a safety net, helping those scholars who need further wrap-around services to succeed. This help includes a special ELD instructional aide specifically for our EL newcomers, coordinating tutoring services and ensuring that IEP push in minutes are effective and efficient. How this model program/practice deals with student social-emotional and behavioral needs. The MTSS component of our model heavily supports student social-emotional and behavioral needs. In addition to providing an on site social worker and school psychologist, the team works with educators to address current scholar behavioral needs. We are currently piloting Calm Classroom, a system of mental focus and meditation, and Community Circles, a system of community building and discussion, in some classrooms thanks to the efforts of our MTSS team. How your school’s model program/practice is aligned to your district’s LCAP. How is the school addressing chronic absenteeism, and/or suspension/expulsion? Suspension/expulsion is handled through prevention measures taken by our MTSS team using many of the systems already listed (coordinated wrap-around services, Calm Classroom, Community Circles, etc). Chronic Absenteeism is handled separately by dedicated office staff who maintain a direct line of communication with parents to ensure our scholars make it to compus every day (also noted in our LCAP Goal 5 Action 1). How program/practice stakeholders are being engaged in the school’s model. The school is dedicated to ensuring that all stakeholders are part of the school’s decision making process. Since all parts of our model live in our LCAP, we leverage our LCAP community engagement process to ensure that parents have a say in how the school operates. For example, our PLC model was piloted by our Math department last year. When we reported to parents the success that our Math department was exhibiting in implementing this model (using interim performance data), they suggested we implement a similar system in ELA. At their behest, we made the necessary changes to our LCAP, presented those to our board and, upon approval, moved forward with the a similar PLC model in ELA this year. Similarly, the school adopted AVID as a means to address middle performers as a result of stakeholder looking at out performance data and giving us input. The methods being used to communicate the model to the learning community. Our LCAP community engagement process is a key method in communicating elements of our program to stakeholders however other methods of communication are also used by the school. During Parent Workshop nights, departments often showcase both the kind of work scholars do and support staff communicate methods of support. Additionally, we have monthly Principal Town Hall meetings and Coffee with Counselor meetings in which we communicate elements of our program with stakeholders, answer questions and take feedback. Furthermore, parents are a key part various powerful decision making bodies at the school such as the English Learner Parent Committee (ELPC), the School Site Council (SSC) and our local School Board. The monitoring and assessment methods being used to evaluate the Program/practice effectiveness of parent/community engagement. We have multiple methods to track the effectiveness of our community engagement. Our parent engagement specialist keeps careful track of sign-ins to see how many parents and community members attend each event. Also, we take yearly satisfaction surveys which gauge, amongst other things, parent satisfaction with our programs and our level of outreach and engagement. The capacity building activities taken related to Professional Learning for teachers administrators, and non-instructional staff. The monitoring and assessment methods being used to evaluate the effectiveness of instructional learning activities. The school constantly reevaluates what it does to determine how best to spend its time and resources. Teacher evaluation ratings, student performance metrics, and survey results are analyzed during regular data days throughout the year. We work with our CMO, the Alliance, to create a SIOP (School-wide Instruction Operating Plan) which includes a long term (multi-year) plan for our professional learning. We monitor and review this plan regularly and our principal reports on the progress of this plan on a weekly basis to an Alliance representative. The Math PLC conducts weekly data meetings where they analyze data such as student sample written work, technological assessments via Illuminate, and teacher observations via video camera to discuss the effectiveness of the instructional activities. In ELA, the department has weekly PLC time in which teachers present an upcoming text and questions/tasks that they will be teaching. Through a Tuning Protocol a focus teacher presents their materials and poses key challenges/obstacles to student learning that the teacher would like support in addressing. The functioning of both PLCs is closely monitored by administrators who work with content level leads to ensure that instructional learning activities are effective. How the monitoring and assessment results are being used to evaluate the program/practice in relation to student outcomes. Administrators and content specialists review GROW Indicator data and determine the key indicator, or lever, to help best develop teacher practice. Based on the data supports such as triad conversations, professional developments, resources, and technological tools are presented to the department members and given opportunities to use these to improve their practice. Additionally, content coaches and administrators monitor assignments ELA and Math teachers use in their classrooms. This then becomes the foundation of PLC work, classroom observations and feedback sessions. During our Data Days and weekly meetings we use our Interim Benchmark Data and Formative/Assessment data to review student performance in highest priority standards. This helps us evaluate how effective we have been in targeting performance of these standards. The quantitative and qualitative data being collected that can demonstrate positive results for student outcomes. Our Charter Management Organization, the Alliance, provides 3 interim assessments throughout the school year across all grades. These interim assessments cycles are followed up with a full-day release for teachers to review and analyze their data, allowing them to make adjustments to upcoming units and lessons. In ELA we are seeing growth in year-over-year data for ALL Students, English Learners, and Students with Disabilities across all grade levels. Some of our biggest gains are coming in Grade 10 where students improved on their interim data by 13% for Interim 1 and 18% for Interim 2 --- in the year-over-year comparison. In terms of progress on the current year’s assessment, overall the English department increased from 65% of students meeting/exceeding standard to 74% of students meeting/exceeding standard. In Math, we are seeing similar gains. Current scholars are performing similar or better to last year’s cohort on interim assessments. Our CAASPP progress in math has been phenomenal. We have 13.19% exceeding the standard (an increase of 9.02%) and 34.03% (an increase of 13.2%). More importantly, we have drastically reduced the percent of students not meeting the standard (only 12.5% in 2018 compared to 39.58% in 2017). Data collected is summarized through a written analysis of findings. 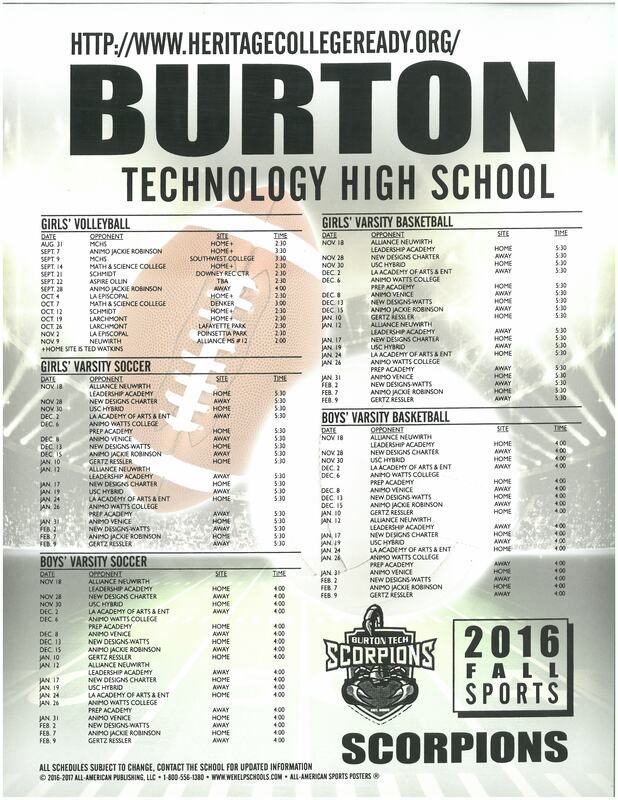 Every year, Burton Tech completes a School Instructional Operating Plan for ELA and Math, which coordinates analysis of student performance data by school administration, content specialists, and Instructional Leads/Department Chairs. This allows the school to determine what systemic or structural changes are needed to support the instruction. Learnings from this intensive analysis are used to make decisions about the content and focus of the ELA and Math PLCs. The MTSS team does a similar analysis of behavioral data and SEL surveys. Recently, they have noticed an uptick in suspensions of Students with Disabilities and this has led the school to pilot aforementioned strategies such as Calm Classroom and Community Circles. The MTSS team also crafts a College Success Operating Plan to ensure that it is providing strong transitional services for our scholars. Findings demonstrate measure of success between targeted and non-targeted student groups. Our data shows growth for every sub-group of students across all four grade levels in ELA and Math. The data-sets for cohort and year-over-year are consistent in growth margins as well. The ELA and Math PLCs incorporate practices that help teachers address their most vulnerable students, including accommodations for lesson planning and disaggregating data to show sub-group performance in interim and summative assessments. Examples of where we’ve seen impressive growth over the past year is with our English Learners, especially in grades 9 and 10 where we have the highest percentage of EL’s. For the year-over-year comparison, Grade 9 increased EL performance on ELA interim 1 by 12% - from 18% in 2017/18 to 30% in 2018/19. The trend continues into ELA interim 2 with a 19% increase - from 17% in 2017/18 to 36% in 2018/19. For Grade 10, the same growth trends appear as well: 14% growth on ELA interim 1 from 2017/18 to 2018/19, and 8% growth on ELA interim 2 for the same school years. In Math, we have seen similar increase within our subgroups. For the year to year comparison, Grade 9 increased EL performance on Math interim 1 by 15% and our Students with Disabilities grew 16%. Similarly the year to year comparison in Grade 10 our EL performance increased 16% on our Math interim 1 and 8% for Students with Disabilities. For our 11th grade subgroups we identified similar growth for our EL students with a 9% performance increase on the Interim 1 and 9% increase for students with disabilities. For our Student with Disabilities, we see positive growth in ELA and Math as well, just not at the rate as English Learners. Each grade level demonstrated growth in year-over-year comparison data on our interim assessments with Grade 10 leading the way with increased in performance by 10% and 9%, respectively, for interim 1 and interim 2. Impressively, our Grade 12 students also demonstrate gains on our interim assessments, which are new for the 2018/19 school year, with increases of 11% and 5%, respectively, from interim 1 to interim 2 for English Learners and Students with Disabilities. These data sets taken together demonstrate a department that is fully embracing the professional learning community approach by collaborating to refine and improve their planning and data analysis skills. How the results are used for continuous program improvement including modifications to accelerate the impact for student successes. As stated previously, the admin team and Math and ELA Department Chairs meet regularly to review and review student performance data in order to make adjustments towards meeting quarterly and yearly goals. Because of this consistent review process, student outcomes are constantly measured and instructional and systemic changes are readily made to support every student. Similarly, our MTSS team meet regularly as well. They review behavioral data (suspensions, expulsions, absenteeism, survey data, etc) to determine whether continue current behavioral programs or to pilot new ones.